From the North: at Caserta Sud get into motorway A30 towards Salerno-Reggio Calabria, exit Salerno, then the S.S. 163 "Amalfitana". 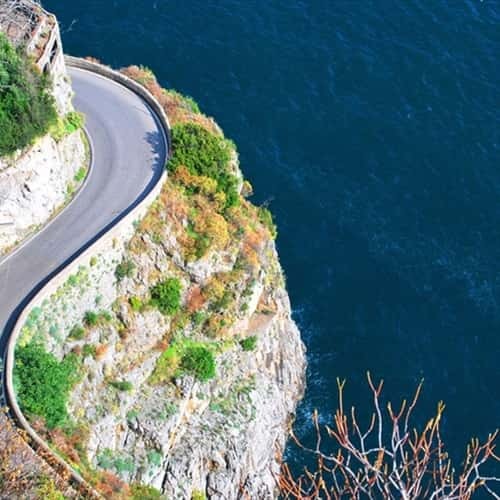 It could be an alternative way, if you have to reach Ravello, Scala or Tramonti, exit "Pagani-Nocera", following the signs "Costiera Amalfitana", then "Valico di Chiunzi". From the South: take the motorway A3 to Naples, follow the road markings to Salerno, then the S.S. 163 "Amalfitana". There are not train stops on the Amalfi Coast; the nearest railways stations are Sorrento to the West and Salerno to the East. From Sorrento or Salerno you can continue by taxi, by buses or by ferries departing from the port of Sorrento or from Salerno/Piazza della Concordia. For all the information, click here. in the following municipalities: Meta di Sorrento, Piano di Sorrento, Sant'Agnello e Sorrento. UNICOCOSTIERA ticke costs 5 euros and can be bought at the Unicocampania sales points, at SITA and Circumvesuviana ticket offices.